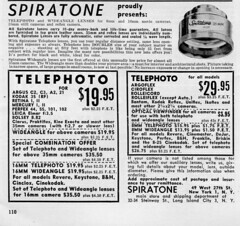 Spiratone was an American distributor, founded by Fred Spira around 1940. Originally his company just offered developing services, as "Spiratone Fine Grain Labs"; but after opening a store in 1946 on West 27th Street, N.Y., the company quickly expanded into distributing cameras, lenses and all sorts of photo and darkroom accessories. The company had a penchant for locating and importing offbeat photographic items—improbably cheap 400mm lenses, fish-eye adapters that screwed onto other lenses—and then promoting them in typographically overstuffed ads in the back pages of photo magazines. 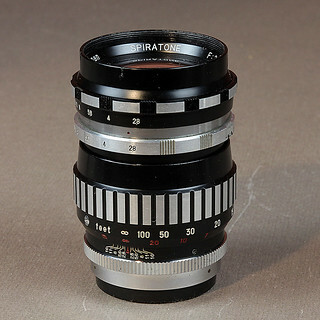 Lenses from various manufacturers were offered under the Spiratone name, including several ultra-wide-angles and a chunky 135mm f/1.8. 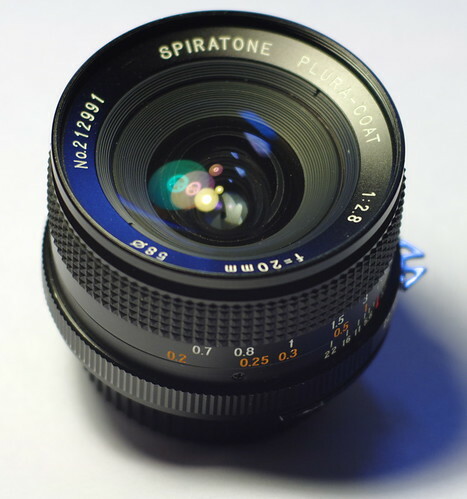 Spiratone closed its doors in 1990. ↑ 1.0 1.1 1.2 Dennis Hevesi, obituary of Fred Spira, New York Times, 14 September 2007. ↑ Advertisement in October, 1942 Popular Photography magazine (vol. 11, no. 4), page 94. ↑ This February 1947 ad from Popular Photography (vol. 6, no. 1; page 172) shows the beginnings of Spira retailing camera accessories. This page was last edited on 11 November 2018, at 05:53.